CES launch shows Micromax is no longer the "cheap phones brand" it used to be. A couple of years ago, there were many who would look down upon people using a Micromax phone. There are still many of those people around. But Micromax is no longer the “cheap phones brand” it used to be. In fact, at the Consumer Electronic Show in Las Vegas, the world’s largest stage for technology and gadgets, this Indian company showed that it means business. Business at a global level to be precise. Known in India for bringing top-end specs at mid range prices, Micromax’s big global announcement was chip giant Intel’s first dual-boot Windows and Android tablet. Intel has been trying its best to get a foothold in the mobile space, and with the second largest smartphone maker in the second largest smartphone market. So it is actually a coup of sorts for both companies. Incidentally, around the same time, Taiwan’s Asus too announced an Intel-powered Transformer Book Duet TD300, running both Android and Windows 8 on the same processor. But that is more of laptop. This is a more of a tablet. Hence Micromax’s is the first dual-boot tablet. The definitions in tech are that thin these days. 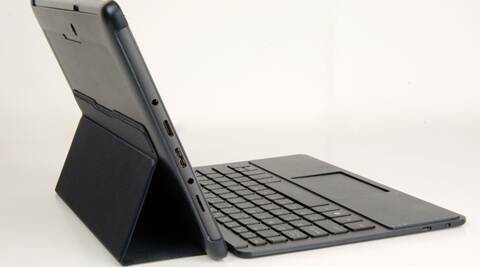 Announced at CES on Monday, the Micromax LapTab will be available for consumers in February. It is powered by an Intel Bay Trail-M processor and will be this first-of-its-kind tablet will run both Android 4.2.2 Jelly Bean and Windows 8, with just a reboot enabling the switch over. At the launch, Micromax co-founder Rahul Sharma made it clear this was their “next leap”, “raising the innovation bar globally”. We should have know this was coming. It was just months ago that the company signed Hollywood heart-throb Hugh Jackman as its brand ambassador. That was indication enough that this company was not eyeing just India, it had the world in its sight. After all, a lot of hinterland India, where Micromax has been making hay for a few years, would not even recognise the wolverine star. But in Africa and West Asia, people do recognise this face. That is the sort of market Micromax has been eyeing for a few years now. It helps that consumers in these geographies are very similar to India and have similar purchasing powers. But a dual-boot device is not meant for them. That is for the urban geek. For that growing consumer base, Micromax will offer the price advantage very few global players bring to the table. Sharma calls this “democratising technology for people around the world”. Coming from the world’s largest democracy, this might be an export that will sell across the world.